As I’ve said before on several occasions, an index is a mind map, the ‘visualization’ of your study as an alphabetical list. This map is implicit in the index but you can dramatically improve the coherence, balance and completeness of your index and the actual text of your book itself by making this map explicit. In the act of plotting and drawing this map, often you will discover both repetitions and gaps in your text. Although you cannot at this stage record any page references against an index entry, nonetheless you will quickly see which entries are common (even over-represented) in your text and which are scanty or missing. If these defects are found at the writing or even editing stages, there is little fuss in correcting the situation. Not so by the time of the final proofs, when it is virtually impossible to make such changes without the typesetter slapping a hefty fine on your publisher (a cost more than likely promptly passed onto you, as we have seen). Read through your text, highlighting words/phrases/paragraphs you wish to index and occasionally scribbling notes in the margin. Collate these colour dabs into an index skeleton (i.e. without any page references). Analyse this index skeleton in terms of coherence but also content, looking for repetitions and gaps in the entries. Rework the skeleton until it equates to a satisfying mind map of your book. Search your text again to see if any of the gaps in your index skeleton are truly missing or simply were overlooked in the initial highlighting of the text. Eventually, you will have reduced the problem to a core of gaps (and repetitions) in the entries. Analyse and adjust your text to deal with these gaps and repetitions. 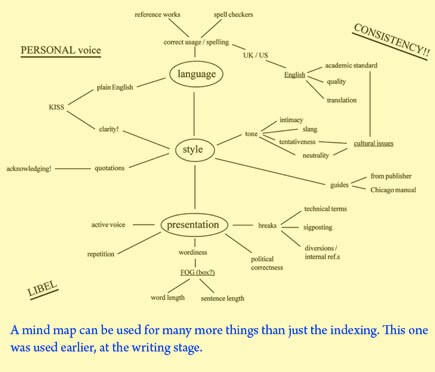 Thereafter, depending on which indexing method you use and provided there are not too many resulting changes to your text, you could use this highlighted version of your study or the mind map to speed up the final indexing process (more about this in my next post). This entry was posted on Wednesday, March 10th, 2010 at 4:36 am and is filed under Publication process. You can follow any responses to this entry through the RSS 2.0 feed. You can leave a response, or trackback from your own site.